Now what female villains do you want to see? Last edited by The Superfly on Tue Jul 31, 2007 8:42 pm, edited 2 times in total. Cheetah! I want to see the Four Horsement knock her spotted hide out of the park. Ivy and Cheetah are both high on my priority list. Other... I think the 4H could do one wild and wicked Silver Banshee! Wait, there's a female Eclipso now? I don't know how to break this to you, but the new Eclipso is Jean Loring, the Atom's ex-wife. I'd tell you how this happened, but it's so bad, I just don't have the strength. It's a different costume, though. In the Day of Vengeance miniseries, which tied into the Infinite Crisis event, Jean Loring, ex-wife of Atom (Ray Palmer) and murderer of Sue Dibny as seen in the Identity Crisis miniseries, discovered the last black diamond in her prison cell, became the new Eclipso and tricks the Spectre into attacking magic-based heroes as her revenge against Shazam, who was eventually slain while fighting the Spectre. After fending off multiple attacks upon herself, Eclipso-Loring was eventually teleported to a non-decaying orbit around the sun by Nightshade. 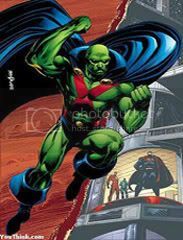 In the pages of Infinite Crisis, it was revealed by Alexander Luthor, Jr. that he had sent Superboy-Prime to recover the black diamond, and that the Psycho-Pirate delivered it to Loring on Alex's orders and manipulated Eclipso into manipulating the Spectre. This was all done in the interests of breaking magic down into raw magical energy, which Alexander could use for his own ends. The death of Shazam was particularly useful, as his various champions then became a tether of power; all Alexander had to do was capture one of them, make them say 'Shazam', and they would summon their lightning bolt to power his machine. In Week Twenty-Seven of 52, Ralph Dibny, on a quest to restore his wife Sue to life and guided by the helmet of Doctor Fate, approaches the Spectre and promises to fulfill any bargain that the Spectre demands in order to restore his wife to life. The Spectre, desiring revenge on Eclipso for his manipulations of him during the Infinite Crisis but rendered incapable of taking it owing to his present lack of a host, orders Dibny to punish Eclipso in return for his wife's life; Dibny, realizing that this meant punishing Jean Loring, his wife's murderer, and temporarily granted the power of the Spectre, takes Eclipso back to the point at which she (as Jean Loring) murdered his wife and, restoring Jean's sanity, ruthlessly intends to trap her in a permanent time loop and force her to watch herself murder Sue Dibny over and over for all eternity. Her sanity restored and Eclipso purged out of her, a terrified Loring tearfully begs for forgiveness, screaming that she 'was crazy' when she murdered Sue and that it 'wasn't me!'. Dibny, affected by her pleas, his sense of compassion and his own feelings on watching his wife's death, finds himself incapable of such ruthlessness and refuses to complete his pact with the Spectre, returning Eclipso to her orbit around the sun. She has most recently been seen in Blue Beetle #16, searching for a new host. Having come to the conclusion that her hosts' corrupted souls are a cause of her failures, she tries to possess a baby with great magical potential and a pure, uncorrupted soul. She is foiled in this attempt by Blue Beetle and Traci Thirteen. In the recent "The Seduction of the Innocent" ad campaign for DC's Countdown, Eclipso's arm can be clearly seen, with Mary Marvel looking off-page and her face half-shadowed. They didn't mention one of my favorite little touches, that she was sentenced to Arkham and sexually abused by the other prisoners. That Brad Meltzer is a classy guy! Funny how the whole universe is open but a Batman villain is winning the poll. But anyways, Killer Frost is my 2nd pick. Hey, we're getting Firestorm! She's basically his arch-nemesis! And Granny goes for my 'other' pick. You just KNOW that Cheetah will be on the short list...so I threw my vote to Killer Frost...how cool would a frosty, pale blue translucent Killer Frost be?? !